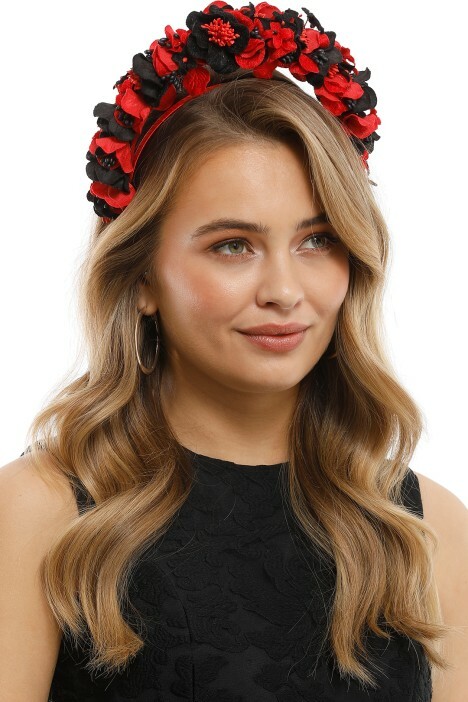 For just the right finishing, and summertime touch to your floral floor-length gown, your lace little black dress, or your bodycon midi dress, this headband is the perfect choice! With a ruffled detail and gorgeous multicoloured flowers along the crest, this headband offers an adorable halo-like design that’s bound to turn heads! Pair this headpiece with a gold-embellished black pod clutch and some statement earrings to complete your look! If you’re still unsure on what to wear to the races, check out our What to Wear to the Races blog post for more than a few unique and beautiful styles and tips! Karlie Floral Halo Fascinator - Red is rated 5.0 out of 5 by 1. Rated 5 out of 5 by Izabella from Perfect to Make a Statement!! I worn this at the races and it was icing on the cake! No one was wearing anything similiar and it was the perfect match to the crisp white dress I also rented from GlamCorner. Apart from other headpieces I worn before, this fascinator was confortable and because of this I was able to wear it all day long. Definitelty recommend!